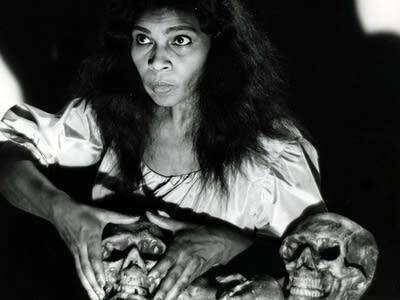 It was conductor Arturo Toscanini who said a voice like Marian Anderson's comes around only once in a century. Sixty years ago Wednesday, Anderson became the first African-American soloist to sing at New York's Metropolitan Opera. She was in her late 50s when she appeared Jan. 7, 1955, in Verdi's Un ballo en maschera. F. Paul Driscoll, editor-in-chief of Opera News, says Anderson was made for the role of Ulrica. "The role of the sorceress is something that depends a lot on the charisma of the performer, the ability to suggest a world beyond what you are seeing in front of you," Driscoll says. "And that's what Marian Anderson did every time she walked onstage." Anderson later said she felt the pressure of that first performance: "I was there onstage, mixing the witch's brew. I trembled, and when the audience applauded and applauded before I could sing a note, I felt myself tightening into a knot." Despite her nerves, and that she was in the twilight of her career, the performance received a huge ovation. "Men as well as women were dabbing at their eyes," a New York Times reviewer wrote. This groundbreaking performance, Driscoll says, was just one step in the broader acceptance of African-American performers in classical music. Just 20 days later, baritone Robert McFerrin — father of jazz singer Bobby McFerrin — followed Anderson as the first male African-American Met soloist. He appeared in Verdi's Aida as Amonasro on Jan. 27, 1955. "The country didn't change overnight," Driscoll says. "There were still problems taking African-Americans on tour for the Met throughout the '50s and the '60s. So in other words, it's not as if everything became rosy in 1955. But seeing this as an important symbol, that this was the beginning of the integration in the deepest sense of classical music, that's why it's important."